Screenwriting is a marathon, not a sprint. Progress can feel slow, and moments of recognition for your effort can feel too few and far between. It’s the nature of the beast. But that means it’s all too easy to get discouraged along the way, when really — you shouldn’t. I had brunch with a writer friend last weekend and he filled me in on what’s been happening. He has a new manager, several projects in development, opportunities to pitch real companies with money to buy and make things. I was thrilled for him, and also inspired. This friend is someone I’ve watched pursue his dreams with diligence, humility, and a positive attitude. (Qualities that not everyone understands the benefits of.) And it’s paying off. Take heart: it does happen. People build screenwriting careers. It’s not an impossible dream. Don’t give up. Keep working on your material and remember to take time to reconnect with what you love about this work that we do. Now. 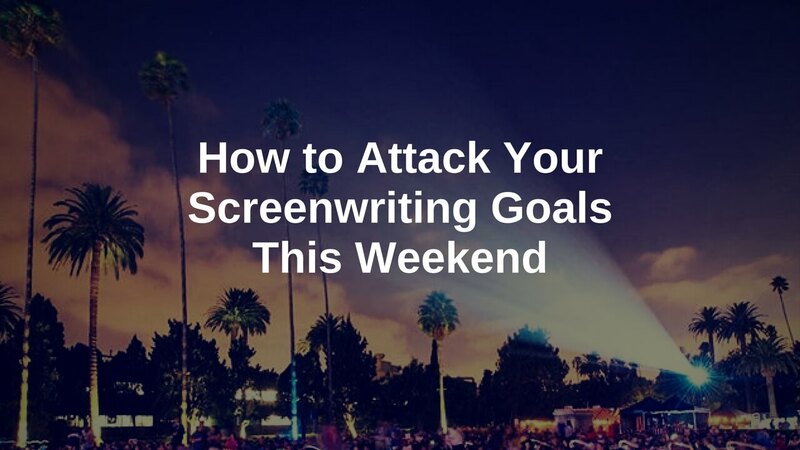 If you’re working on your screenwriting while you work a day job, weekends may be your only real opportunity to move the needle on your writing projects, your goals, and your career overall. But you know it’s going to take more than that to get where you want to go. So I wanted to make it easy for you. Organized by different stages of the writing process, here are ideas for action-oriented tasks you can tackle that will move you closer to your goals this weekend. Pick one, decide when you’re going to do it, and commit to taking action. Get inspired. Get motivated. Make it happen. + Give yourself an hour or two of uninterrupted time, and get in the brainstorming mindset. All ideas are welcome. No distractions allowed. No pressure, but try to stay focused on the task. Use these three games as a starting point. + Take yourself to a good bookstore. Peruse classic literature for timeless stories, the magazine section for what’s current, genre sections for “hook” inspiration, and nonfiction for interesting subject areas. + Get physical. For me, a good bike ride is some of the most productive thinking time I can get. Stanford researchers found that “creative thinking improves while a person is walking and shortly thereafter.” So carve out some time to get moving. Writing can be a long, lonely slog and it’s easy to lose your enthusiasm for the pursuit. Being surrounded by likeminded people can help keep you motivated, but what if you don’t have a writing community in your area? What else can you do to rekindle that spark? + Remind yourself what you love. This one’s easy: watch your favorite movie. You know — the one that always makes you want so badly to make movies you can practically taste it. + Imagine your future. Listen to people who are doing what you want to do, via DVD commentaries (here’s a list), or podcast interviews. Don’t know where to start with podcasts? Some of my favorites are: any episode of Scriptnotes, Brian Koppelman’s interviews with Mike Birbiglia and Scott Frank, Pilar Alessandra’s interview with Terry Rossio, and Jeff Goldsmith’s Q&A with Jeremy Saulnier and Macon Blair, filmmakers of Blue Ruin. There’s also the Nerdist Writers Panel, which has an amazing archive to dig into. + Join or create your own virtual community of likeminded people. Get inspired by others just like you, who are doing and making and creating every day. You’ll find a supportive group of screenwriters in Screenplay Lab, our private Facebook group. + Anders Ericsson’s book Peak: Secrets from the New Science of Expertise. It’s not a screenwriting book. Instead it looks at the bigger picture of how people can become experts — in anything, even screenwriting. Use your analytical skills. Go deep. Think about what you’re seeing. Ask yourself if it’s working for you, and why. Ask yourself how it could be fixed. Or what other directions could have been taken. A good way to take this further is to watch a movie and compare it to the screenplay. 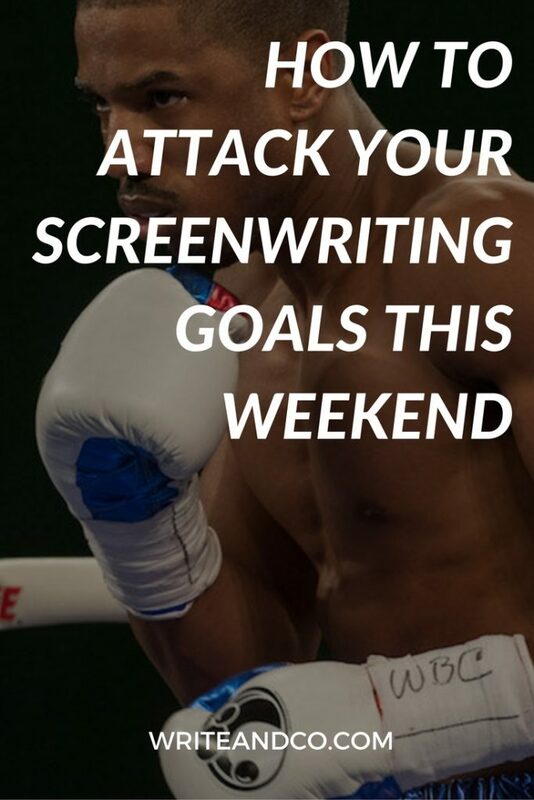 + Stretch other screenwriting muscles by analyzing the screenplay for a movie you haven’t seen. Try winners of the Nicholl Fellowship or scripts that make the annual Black List, so you can gauge where the bar is set, and so you can have the experience of reading screenplays without any bias from the finished movie’s casting, marketing, etc. + Vet your concept — does it have a hook that entices? + Test your logline on an audience. Try the Screenplay Lab Facebook group, or add your logline for feedback here. + Listen to other people workshop their ideas, and evaluate yours along the way. The Inside Pitch podcast is great for this. Though it’s discontinued now, the archive is still an invaluable resource. + Figure out what type of story you’re telling, and what the general shape of the narrative will be, via Blake Snyder’s ten “genres”. + Study other movies in your genre. Again, this is to be approached with the right mindset. You’re analyzing and studying, not just passively consuming. + Let the ideas flow. Feeling inspired by an idea but don’t know where to start? Try the braindump first, organize later method. + Develop the WHAT and WHY of your story’s stakes to make sure it will engage your readers emotionally. + Learn how Pixar sets up their stories, then see if the same structure works for yours, with this video of Michael Arndt explaining elements of the first act. + Use this (old but still good) Scriptshadow article as a way to brainstorm the kinds of things you want to achieve in your second act. + Figure out how you’ll show a character’s transformation. + Find inspiration by exploring how theme works in stories. + Easily plan your supporting cast of characters by thinking of their story function. Here’s the fun part, right? Putting your words on the page. Making your vision come to life. + John August’s advice on how to plan a scene. + There’s a quick hack for differentiating characters in this article. + Get serious focus by working in sprints with the Pomodoro technique. Set a timer for 20 minutes, and focus only on completing one small goal during that time, like writing a particular scene, writing a set number of pages, or researching a location (the details of which you’ll use in your next sprint, when you write it into your script). When the 20 minutes are up, take a five minute break, then reset the timer and do it again. + Why not put on your Reader Hat and look at your screenplay one more time. How is the read? + Having trouble assessing your own work? That’s okay — it’s a really hard thing to do. Work with me to make your screenplay reader-ready. + Work on nurturing your industry relationships. Reach out to existing contacts for a friendly check in and to congratulate them on any recent success. + Create new inroads. Get strategic about your networking. This episode of the On The Page podcast has some good advice on the topic. Good news: everyone loved it! Your screenplay is ready to submit! + If you’re going to try cold querying, get that query letter ready. Here are some tips from Screencraft. + Remember those relationships you nurtured? Consider which of them you might be able to ask to read your screenplay. The most important thing to do to achieve your goals, is to keep going. Choose a mission and tackle it this weekend! And if you want a little extra support, share this post and your plans with a screenwriting friend so you can hold each other accountable! Wonderful and encouraging. I think this is the best blog that I can utilize to get to where I yearn in life. Thank you for the content.